The trick is to pull all 5 levers. Most companies pull only one or two of the 5 business partnering levers, and that’s why they leave most of the business value on the table. Lever No. 1. Agree the Business Value Decision and Opportunities. Start with the business. What are the most important business decisions? Which decisions are material or risky? Is Finance really involved in decision-making today or just providing information as input to someone else’s decision? Agreeing the ‘business value decision is the first lever for a good reason – it’s the most important lever to get right. Yet this is the lever that most Finance Directors skip over, and pay lip-service to. It’s easy for business leaders to logically agree that Finance should change its role to add more value to the business. But do you really have the emotional commitment from the business that Finance should drive strategy, genuinely influence business decisions or drive business performance? That’s a bit harder to agree to! Lever No. 2. Clarify ‘Business Finance’ roles. Segment the ‘business-facing’ part of your Finance organisation into areas of specialisation. For example consider separating out reporting or analysis roles from decision support or business partnering. The goal is to unburden your business partners from day-to-day number crunching. Too many business partners enjoy double-checking and playing with numbers! Lever No. 3. Develop Business Partnering Skills and Capabilities. If you’re in the early stages of business partnering you should focus on ‘Value Finance’ capabilities, such as providing analysis and business insight, and ‘Business Acumen’, such as proposing business solutions rather than technical finance solutions. These capabilities will give your team the all-important credibility with the business. If you’ve been practicing business partnering for a while, then focus on developing the more advanced skills of ‘Engagement’, such as challenging and influencing decisions, and ‘Leadership’, such as becoming a trusted advisor. In our Best Practice Report we’ve identified the 20 capabilities needed to excel at business partnering. Lever No. 4. Free Up Time for Business Partnering. One of the most common traits of business partners who have been in role for a while is to lose sight of where they should be spending their time. They can get bogged-down in low-value activities if they’re ‘embedded’ inside business units. Regularly re-visit which parts of the business drive the most value and re-align your finance teams accordingly. Lever No. 5. Provide Decision-Driven Management Information. Finance departments often generate reams of data, especially at month-end. But do you know how much of it is really used for making business decisions? 80% of business decisions are about looking forward and influencing the future, rather than looking backwards. How much of your management information is about looking forward to drive decisions, rather than reporting the outcomes of the past? Are you genuinely pulling all 5 business partnering levers in your Finance organisation? Where are the biggest gaps? What more can you do to help your Finance teams to drive real value into your business? We conduct a lot of Diagnostic Gap Assessments for Finance Directors to ‘Hunt for Business Value’. How does your Finance organisation compare with our best practice benchmarks? 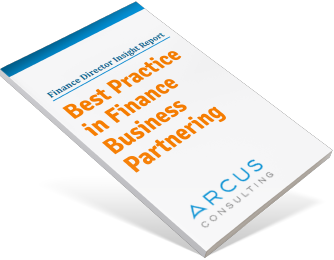 What are the gaps and opportunities, and what do we recommend to change in your Finance organisation to improve finance business partnering? If you’d like an informal conversation about whether our experience may help you please get in touch. 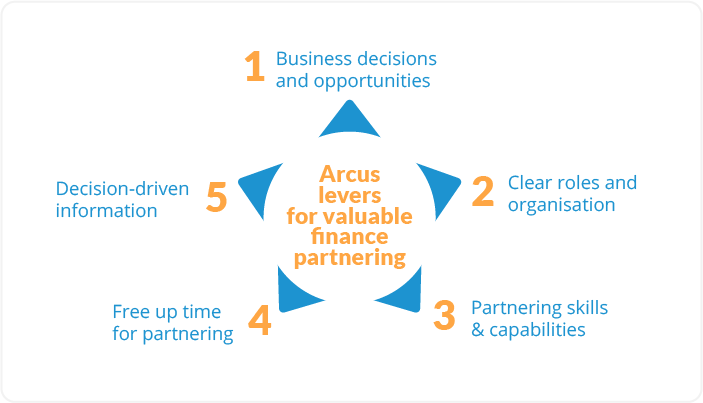 Arcus helped us to realise how much more value Finance can add to our business teams. Their experience and collaborative approach is pretty unique and has really helped our business.